Members of gyms and health clubs have now come to expect air conditioning within their chosen establishments. With stiff competition for members, even small gyms are now looking for low cost air conditioning solutions to remain competitive. Why is air conditioning in gyms important? SAFETY: Air conditioning your gym prevents athletes getting to hot and suffering the discomfort of dehydration and heat exhaustion, resulting in headaches, cramps and fatigue. When its to cold, its harder for members to properly warm up and the risk of injury increases. CONSISTENCY: Air conditioning provides a stable temperature, which is an important factor when athletes are measuring their performance improvement. COMFORT: You want your members to enjoy there gym experience without feeling they could have had a better workout out if only the temperature was right. Not only does air conditioning regulate temperatures, it also filters the air and removed excess moisture (all our air conditioning systems are also dehumidifiers). Not all gyms and have deep pockets for leading edge air conditioning, hence we have developed a low cost solution that provides maximum heat and cooling duty for minimum cost. 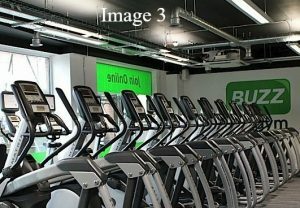 Our latest project was a 300m2 gym in Horsham (Sussex), which was completed in less than a week and we did not require the gym to be closed. We used two 25kW high static ‘ducted’ air conditioning units suspended from the roof girders. 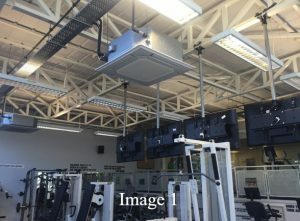 These air conditioning units distribute heated or chilled air along galvanised steel ducting and projected downwards into the gym from embedded adjustable grills. The client was delighted with the results and the cost (under £16,000 in 2018). 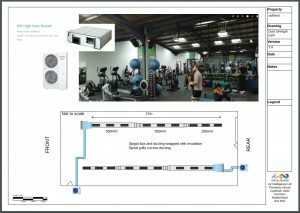 Some new gym owners often mistake ventilation systems for air conditioning systems. When you see ‘un-insulated’ ducting as in ‘Image 3’ below, this will invariably be a ventilation system. These systems simply bring in fresh air from outside and do not provide a cooling solution other than when the outside air is cooler than the indoor air. Sometimes these systems have electric heaters in the ducting to prevent very cold air being brought into the gym. 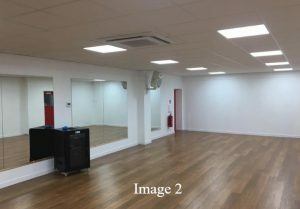 The first and second images below us ‘cassette’ style air conditioning, which again can be a low cost means of providing air conditioning to your gym. This method works particularly well when a suspended ceiling exists as in the 2nd image.